This is a little reminder to myself that I need to be open to new ideas, new ways of doing things, new looks at old stuff. I do need reminding, especially as I grow older. Getting set in my ways was never one of my goals in life. 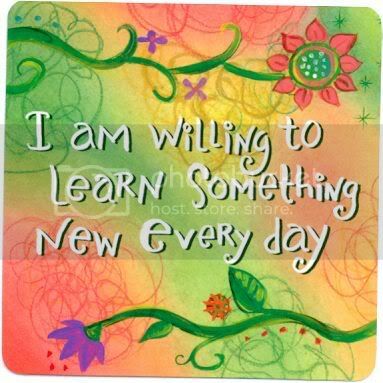 I want always to be learning something new - everyday. Such a great challenge to yourself! When Eric and I tried paddle boarding a few weekends ago, I was super nervous. But I ended up liking it - and being really good! I would have never known unless I said "yes" to something new. Enjoy your adventure, step by step! That's great! I try to learn new things all the time. You are so right! I need to do the same... Thanks for bringing this to our attention..
Kristina, so glad you challenged yourself for a new adventure! Pumped, isn't it fun to have new knowledge or skills? Ginger, glad I encouraged you!